On a chilly Sunday evening in Allentown, neighbors met neighbors, sharing the flame and calling for the end of hatred everywhere. 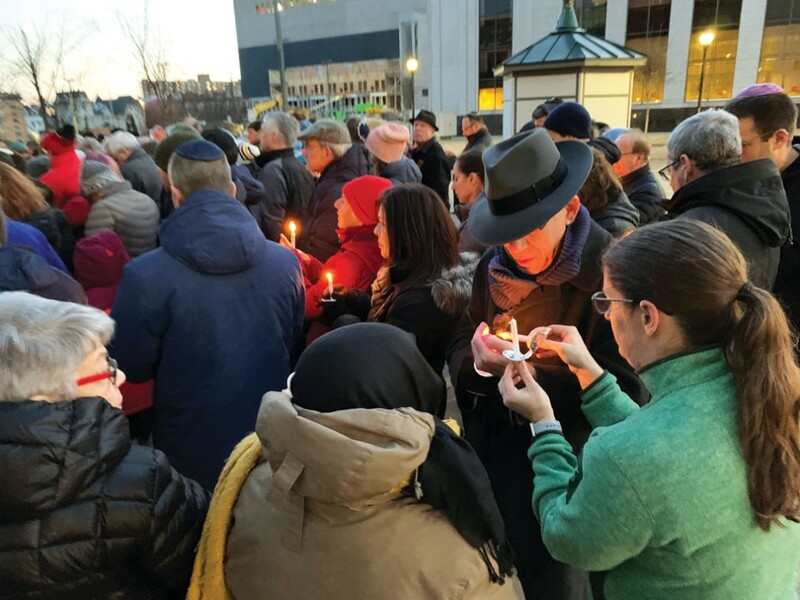 More than 200 people gathered at 7th and Hamilton Streets on March 17 for a vigil organized by the Muslim Association of the Lehigh Valley and the Al-Ahad Islamic Center in the wake of the terrorist attacks on two mosques in New Zealand that left 50 dead and many more wounded. Many members of the Jewish community were there to show their support, less than five months after the Muslim community stood in solidarity at the JCC to remember the victims of the Pittsburgh synagogue shooting. Prior to the vigil, on the day of the attack, representatives from the Jewish community gathered with the Muslim community and other faith leaders to condemn hatred at a press conference. Leaders of five mosques in the Lehigh Valley spoke, at times their voices cracking as they talked about explaining to their kids that it’s OK to wear hijab, to go to school, to play soccer, said Mohammed Khaku, a leader in the Lehigh Valley Muslim community. “We are heartbroken. We are in mourning with our Muslim family in New Zealand. We are doing our best, as individuals in grief, to hold each other close,” Khaku said later. “The Jewish community of the Lehigh Valley is saddened, shocked and outraged by the terror attacks in Christchurch, New Zealand, today in which at least 49 people were murdered and many more were injured while attending Friday prayers in two different mosques. We strongly condemn this attack, which is a barbaric assault on every person who believes in the dignity of human life … Our community stands with our Muslim brothers and sisters – in New Zealand, in the Lehigh Valley and around the world – in the face of extremist hatred and violence."